Weather related cycling moments, and how to avoid them. We recently talked about the current freezing weather, and the importance of dressing for the occasion, with the correct jacket and bib tights. Although it would seem normal to consider these two items as the most important when preparing for a cold, wet day in the saddle. It’s actually our extremities that will suffer the most if not protected in the right way. No matter how cold it is, our bodies and legs will generally warm up quite quickly once the physical effort starts to kick in and the blood starts flowing. Our fingers, feet and head however rarely follow suit. There is nothing worse on a cold wet bike ride than losing all feeling in your hands and feet, followed by an “infant-like”, lack of ability to even undress after your ride and finally the excruciating pain as chilblains decide to take over! Believe me! I’ve experienced this on plenty of occasions and it's not at all pleasant. 2000 Tour de Pays Basque: 'Anything to please the boss"
The tour of the Basque country is already one of the toughest spring stage races on the UCI World tour calendar. 200km average stage distance, half a dozen classified mountains and a further 25 unclassified - just thrown in for fun. Not forgetting the local Basque riders attacking from the gun so that they are in the break when the live T.V coverage starts later in the day. On this particular stage, it was snowing for the 3rd day in a row, and my early season form certainly wasn’t ‘Tip Top’. About 70km into the stage and already freezing and soaked through, I was sent back to the team car to collect fresh gloves and bottles of warm tea for my teammates. Having navigated my way back through the convoy of team cars, picking off my colleagues one by one, doing the tea rounds, I made my way back to the front of the peloton to be kindly asked by ‘The Boss’ (Lance Armstrong) if I could drop back again and fetch him a dry cap! Disheartened and tired from my previous effort, I moved over and dropped back to the cars again. This time, however the pace lifted as we approached the next big climb, the bunch turned into a single file 60kph train, which I was tempting to pass at 65! I did actually manage to pass the entire group, and just about thrust the cap in Lance’s hands as we turned onto the climb. The next thing I remember was a 15% sign and a 9km to the summit sign! That was the last I saw of the depleting bunch for the rest of the day. 140 very lonely, very miserable, very cold kilometers later, I crossed the finish line, rode straight through to the hotel, rode my filthy wet bike through the entrance, across the lobby, into the lift, down the corridor, and into my room. I couldn’t even unclip from my pedals, so I just fell onto the bed, still attached to my bike. I was quite excited by the thought of a warm weather, January training camp in the Arizona desert. Shorts and jersey in January! What more do you want, when you are training for 6-7 hours a day? What I wasn’t aware of in the desert, is how quickly and how drastically temperatures can change. A pleasant sunny morning soon turned into a Siberian like climate when it started to rain 3 hours from home. Everybody was caught completely off guard, and grown men could be heard crying and whimpering for miles, with no dry place to hide. On our return to the hotel, My roommate Levi Leipheimer and myself had to be literally picked up and lowered into a hot bath together, whilst the team helpers tried to undress us both, as we had lost total use of our hands, and could not even unzip a jacket or unbuckle our helmets. The Tour of Poland always used to be a pre-World championship event in September, so the weather was always questionable. Especially with the final stages being based around the popular ski resort of Karpacz. The first time I rode, I was part of a mass pile up on wet train tracks which left me 10 minutes behind the peloton. A 120 kph sticky bottle (tow from the team car) for about 5 minutes, soon put me back in contention, but my gloves were torn and my hands freezing. A few minutes later, elder statesman and all round good guy, Jens Voigt saw me shaking my hands like a mad man. “Are you hurt man”? “No Jens, I just can't feel my hands”. “Do you gotta pee?” He said! “No Jens, just cold”. “But can you pee?” he said. “ I guess so”. “Then you gotta pee on your hands man”! He then explained how urinating on my hands and then putting dry gloves on, would make it all better! I took the advice of the great man but I cannot remember how it turned out. As a more experienced pro, and with clear memories of racing in bad weather, I now traveled to races fully prepared. All pro-riders have what is known as ‘a wet bag’ or ‘rain bag’ in the back of the team car. This contains spare shoes, spare jersey, shorts, and usually spare gloves, arm and leg warmers. I was laying 5th overall, heading into the BIG mountain stage, and wasn’t going to ruin my chances in the predicted hail and snow forecast for the weekend, so I had 4 pairs of spare gloves in my rain bag, just in case! I kept myself cool and out of trouble all day long. Changing gloves twice in the first half, ensuring everything was functioning correctly for the Grand Finale! The first two laps of the mountain circuit caused absolute carnage. There were only 10 of us left to fight out the stage and the overall GC. I was at the point of losing the feeling in my hands, after a long descent, so decided to quickly drop back to the car for some dry gloves, in preparation for the fireworks on the final 2 ascents. They came up to me, a big smile on the team managers face. “Your looking great today Jamie, stay focused! What do you need? Energy gels?” he said, “No, more gloves” was my reply. His face went pale, and his smile dropped! Erm!! Erm!! We gave them to the other guys, as we noticed you had so many pairs! 10 minutes later and I’m going straight on every corner, with no ability to pull my brakes, or change gear to get moving again. I held on for a reasonable 6th place, but with full use of my hands, who knows what might have been? On a very early Continental race trip to the Czech Republic for a round of the Super prestige cyclocross series, I experienced what ‘real cold’ weather was for the first time! During warm-up, the temperature was recorded as -15, with a wind chill of -20. Back then my wardrobe of cycling kit wasn’t so ample, which put me in panic mode. I ended up using hot warm-up balm on my hands and feet. Ski gloves and plastic bags over my cycling gloves. Plastic bags, woolen socks on my feet and over my shoes. And to top it off, my casual sweater under my skinsuit, and a bobble hat over my traditional “Danish” (hairnet) style helmet. All of this additional clothing didn’t make a blind bit of difference! I was cold and had no results to speak of at the end of the race. I obviously take all this experience and knowledge into the clothes and equipment I design and pass on this on to the team to make sure we produce clothes that keep you warm when it’s cold, dry when it’s wet and, cool when it’s hot. Here are my top items for keeping warm in winter. 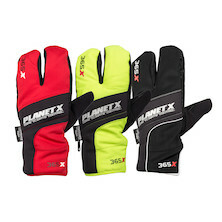 These 100% waterproof gloves are your best choice for extreme conditions. 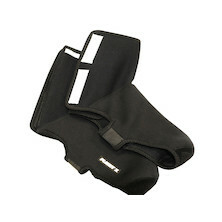 A warm inner fleece liner is combined with a breathable Hipora, waterproof and windproof shell. 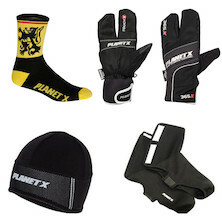 Despite keeping your hands toasty and dry, these gloves are not bulky, allowing good gear shift and brake action. 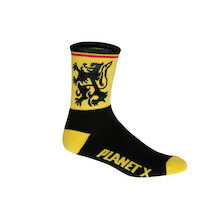 Perfect for extreme weather riding and racing. One of our oldest existing products, and still the best! Having a completely waterproof overshoe is pretty much impossible, due to the cleat and heel openings on the under sole of all overshoes, so the next best thing we can do is make sure you stay warm! Made from the same neoprene fabric used by deep sea divers, this classic overshoe offers a perfect snug fit whilst keeping your feet toasty, even in the worst weather. Cold feet are not only painful, they will also affect your performance when you can’t feel the pedals. Our 100% Merino socks, maintain the anatomic cycle specific fit of our standard Coolmax socks, whilst keeping you warm with this soft natural fabric. Merino has a fantastic property, keeping you warm and dry in cold weather, but also cool and dry in warmer climates. 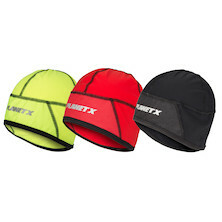 Gone are the pre-helmet days, of the traditional winter, peaked cycling hat! 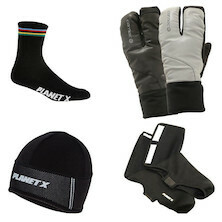 For many years the only real option for winter riding. With helmet use pretty much the norm, and I would recommend that you always wear a helmet whilst cycling. The PX under helmet cap is the ideal option, as it’s warm fleece inner is comfortable against the skin, whilst the Windtex outer helps deflect the cold winter wind chill. All this in a close fitting cap, that fits perfectly under all helmets.